Viber is an instant messaging and VoiP (Voice over Internet Protocol) that functions much in the same way as Whatsapp and Skype. Its popularity has waned in the past year and might also be the reason you’re looking to delete the app, which is better than having three different apps doing the same thing. Another reason to delete or erase iPhone Viber might be to free up space for other things – media, apps, etc. Another often overlooked reason is the issue of privacy. 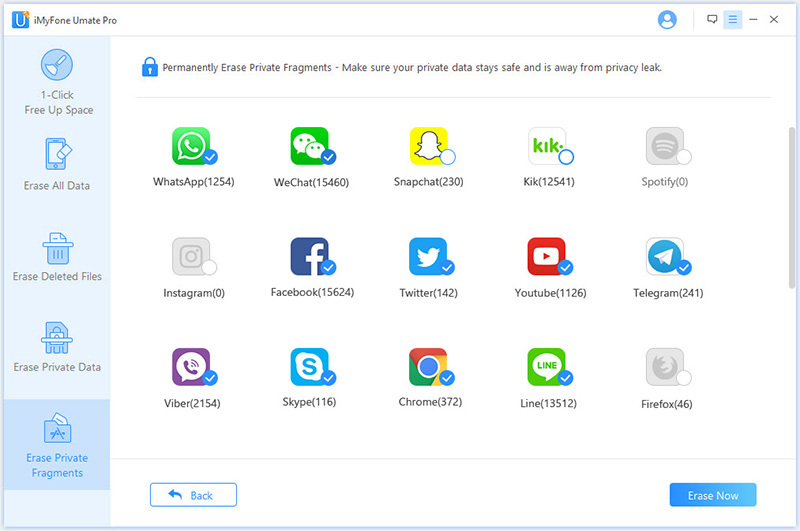 Since it’s a messaging app, very private information might have been exchange, thus, making users require the removal of such private data. 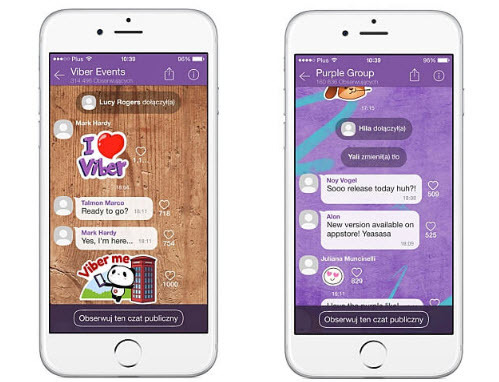 Yes you can erase Viber from your iPhone, as it is a third-party app. Before erasing the app though, understand that just deleting or uninstalling the app will not suffice as your account will still exist with Viber. If total deactivation is what you desire, you can do that from the app’s settings. Go to the “Settings” app from your home screen, go to General > Storage and iCloud Usage > Manage Storage. Scroll to Viber and tap on it. Select “Delete App”, then select “Delete App” from the popup menu to confirm the app deletion to delete all Viber data from your iPhone. Kindly note, that what this does is to remove all the files and data from your iPhone 7; even though they can still be on your Viber account. Additionally, powerful recovery tools will recover these files and data from the iPhone as long as the only method of deletion was via the settings app. This takes me to the next point: erasing iPhone 7 Viber files and data permanently. 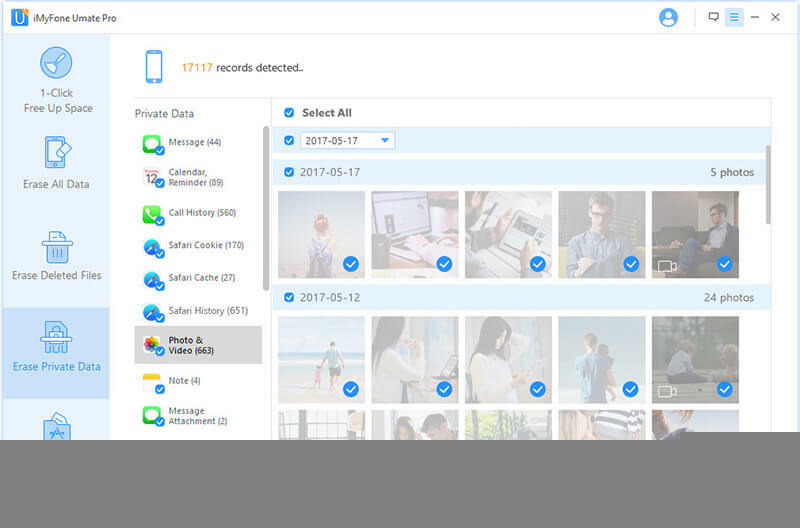 iMyFone Umate Pro or iMyFone Umate Pro for Mac is an iPhone 7 utility that helps manage all kinds of data on all iOS powered devices. Its data erasure is more powerful even than normal reset, as it erases data and files completely and permanently in a simple yet efficient manner. Clear Viber Cache for Free: 1-click to clear junk files will remove Viber cache and other apps cache, corrupted files, crash logs, etc. Erase All Viber Data: It's "Erase All Data" will make all deleted Viber data unrecoverable anytime. Erase Traces of Viber: Incomplete fragments or traces left by Viber will be found out and completely destroyed to protect your privacy. iMyFone Umate Pro wins lots of loyal users, and is reported by famous media, like MacWorld, iPhoneinCanada, APPKED. Step 1: Have iMyFone Umate Pro downloaded, installed and launched on your computer. Connect your iPhone. Step 2: Choose the erase mode and let it scan. Step 3: Preview and select data to erase. Basic Erase: Despite the tag of basic, this option frees up space and improves performance by helping you delete and remove temporary and junk files. 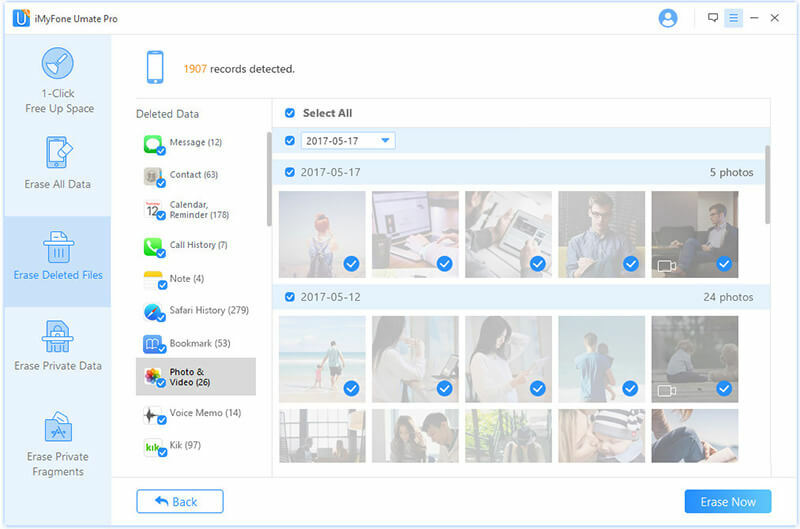 Options include deleting and removing temporary and junk files, backing up and deleting photos from your device, removing apps efficiently, and compressing your photos to gain more space. But note that the files deleted in this mode can be recovered by recovery tools. 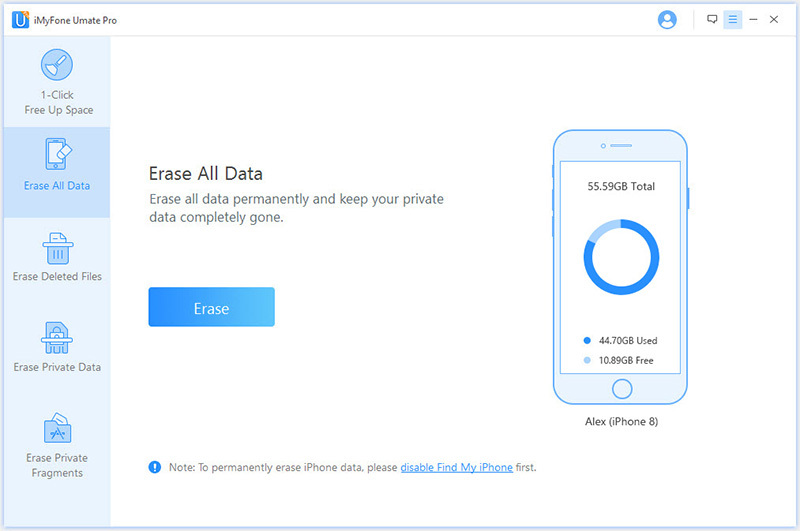 Erase All Data: This mode erases all the files on your iDevice. With this option, you do not need to reactivate your device again. And all data and files deleted cannot be recovered. This is a bulk data deletion. Erase Deleted Files: In the past, you would and should have deleted files and data you don’t need for various reasons. People with access to data recovery tools can and would unearth your deepest buried secrets on your device. This mode allows you search your device for previously deleted files. You can preview these files and proceed to erase some files you want, or erase all permanently. Erase Private Files: Private files are so called because they should always remain private – for your eyes only. 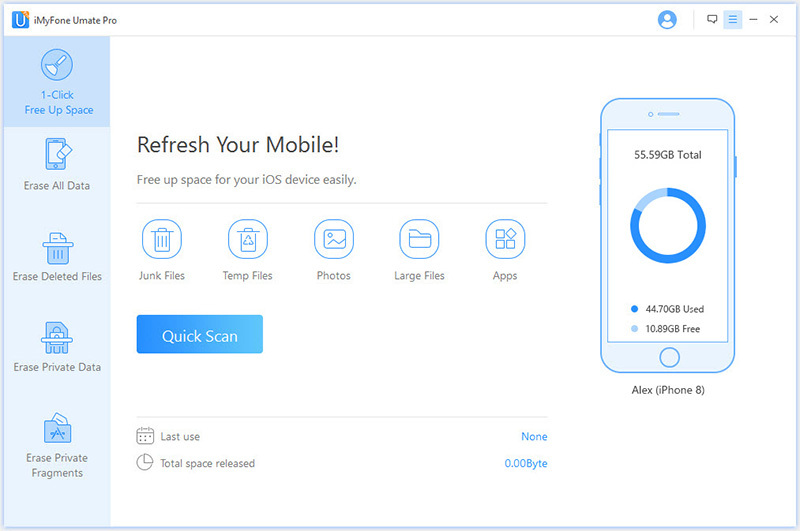 This mode allows you to scan your device for all existing private files. You can then preview the files and erase selectively or erase all if you wish so.